A cup of tea is one of life’s most pure and simple indulgences. It is quick and easy to prepare, perfect to share with a friend or late at night with a good book, and it holds the mysterious power of being able to reset the balance of a hectic day. Most importantly though, it is one of the few pleasures in life that doesn’t have to be rationed or cut out completely during pregnancy. I’m currently 26 weeks pregnant with baby number three and while I have somehow dodged the dreaded morning sickness once again, I am prone to indigestion, heartburn and all those fun digestive issues. I hadn’t even thought about herbal teas as a solution but luckily a review of Mama Body Tea came up just at the right time. For the past week, my bliss has been found at about 8pm in a cup of Mama Body Tea – Soothing Tea. It is the perfect way to unwind after my two and three-year-old boys have been put to bed and the house is back in order. And it works – for the first time in months, my system is settled enough to drift off to sleep peacefully, comfortably, and at a decent hour. The Soothing Tea is a special blend of loose leaf tea that contains all organic ingredients that ease digestive discomfort including peppermint leaf, ginger root, fennel seed, rosehip and marshmallow root. While the blend has been given the thumbs up by in-house naturopath and herbalist, Anne Cousins, it is not a concoction to fear or a chore to drink. It smells divine and tastes even better with a sweet, pepperminty flavour. The other organic herbal tea blends in the Mama Body Tea range include Morning Wellness Tea to relieve nausea in those early days of pregnancy, Raspberry Leaf Blend to help prepare for labour, Mamas Milk to establish milk supply and soothe bub’s digestion through your breastmilk, and Baby Bliss Tea, a specially designed blend that can be administered to babies who are suffering with colic, wind and teething. 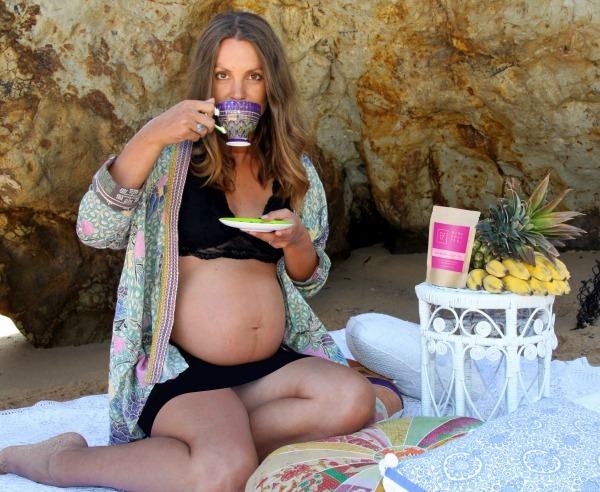 Mama Body Tea is proudly Australian owned and operated. You can discover more about their all natural, healthy range of teas and gift ideas at the Mama Body Tea online shop. Tea blends cost $15.95 each and contain approximately 28 servings while the gift packs start at $54.95 and make a wonderfully unique and thoughtful baby shower gift. Postage within Australia is free and shipping is available worldwide.